There it was. A four leafed clover. I picked it up and put it with the others. Tom and I found five of these little mutants in five minutes. So how do we get so lucky? Simple. We look. 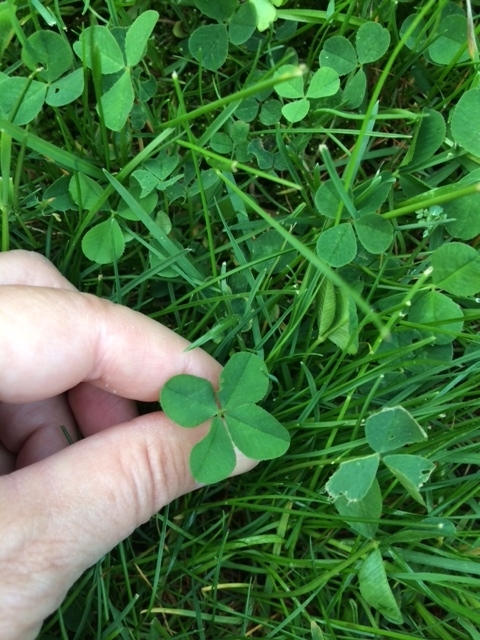 Four leafed clovers are everywhere in the Springtime. But because most people don’t expect to see them, they don’t look. Clearly, God’s qualities are on display throughout His creation. He wants us to be reminded of Him as our “bridegroom” in the everyday sunsets, storms, and seasons. We can expect to learn more about His awesome power when we expectantly look for it. We who know Christ don’t worship nature, we worship the one who created it! If you’ve got even three out of the five senses, you’re pretty lucky today. You’ll see, hear, smell, touch, or taste some of what the God of the universe is revealing about Himself–especially if you are on a hike. We felt the wind and rain, the burning of a stinging nettle plant, the cool of green grass on bare feet, and the stiff quill of a turkey feather. We smelled distant campfires, pine forests, lake water, and hiking boots. We heard all kinds of birds (the creepy mourn of a screech owl, the robotic gargle of a pileated woodpecker, the whirling buzz of a veery…) and we heard water bubble over rocks, wind through leaves overhead, the rumble of thunder, and the whine of mosquitoes. And we saw four rattlesnakes, a porcupine, a bald eagle, some cool looking butterflies, and blue skies through green leaves so bright it took our breath away. So get out there and expect to get lucky this week. Open your senses to what God might reveal about Himself. Enjoy your weekly hike.